National Talent Search Examination ( NTSE) - for students Studying in class X is meant to identify the nurture talent. The National Talent Search Examination for students studying in Class Xis meant to identify the nurture talent. The examination is conducted every year at two levels: Stage-I (State Level) and Stage-II (National Level). (a) Scholarship ofRs.1250/- per month for Class-XI to XII. ( c) Amount of Scholarship for Ph.D. is fixed in accordance with the UGC norms. Qualifying Marks: Qualifying marks for candidates from SC/ST/PH category is 32% in each paper and for others (General/OBC) categories it is 40% in each paper. Application Form: You may contact the State/UT Liaison officer for procuring application form . The completed application form should be signed by the Principal of the school much before the last date of submission. The candidate as well as the Principal of the school must adhere to the last date for submission of the Application Form. Different states may have different last dates for submission. Please confirm from the Liaison Officer of your state, the address at which the completed forms are to be submitted. The address and contact number of the Liaison Officer of the States/UTs are available (State-wise) in the NCERT website www.ncert.nic.in. All queries related to application form should be directed to the State Liaison Officers (LOs). No application should bt sent to NCERT . Fees: States and Union Territories may notify the fee required which will be paid for the Stage-I examination. Therefore, before submitting the application form, you may find out the fees charged for Stage-I Examination and also the mode of payment from the respective State Liaison Officers (LOs). However, NCERT does not charge any fee for Stage-II examination. Indian Students Studying Abroad in Class X can appear directly for Stage II NTS Examination under conditions prescribed in the NTS brochure which is available on the NCERT website. 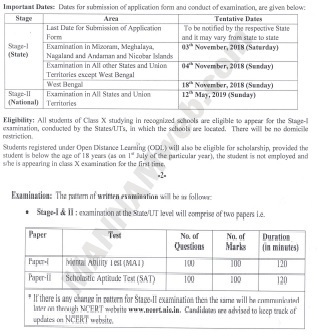 Candidates may fill up the Application Form, available on the NCERT website and send to the undersigned along with a photocopy of the mark sheet of previous examination, latest by December 31•1, 2018. Application Form for students studying abroad will be uploaded on NCERT website in the month of October, 2018. Announcement for students of Indian nationality studying abroad will be announced separately.